Winter is quickly approaching, which means it’s almost time to turn your heater on. You may not have given any thought to your heater since you turned it off in the spring, but you should be doing regular heater maintenance to keep it running smoothly. We have 5 reasons why heating maintenance is so important, and if you need to get your HVAC in Newtown, PA looked at before winter comes, we are here to help. If you don’t check your heater before you go to use it on the first cold morning of the season, you may get an unpleasant surprise when it doesn’t work. Getting your heater checked out regularly will ensure that it will work when you need it so you’re not stuck in a cold house. The better shape your heater is in, the longer it will last. 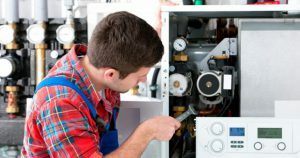 Heater maintenance will make sure everything is running properly and getting any parts cleaned up or replaced to keep your heater running as long as possible. Heater maintenance will actually save you money. If you get it regularly checked out and cleaned, your heater will last much longer and you won’t have to spend a lot of money to replace it every few years. It also saves you money on your energy bills because your heater won’t have to work extra hard with parts breaking or air filters filled up. Heaters that are broken or not cleaned can be fire hazards. Broken parts in your heater can cause it to overheat, and having dirt and dust buildup can cause it to overwork. Heater maintenance can fix these problems before it’s too late. If you need a maintenance check on your HVAC in Newtown, PA before winter arrives, contact Chud Air Conditioning & Heating today and see how we can help.